Yeah, I know what you're saying there - I do like brat bikes but it takes a lot for one to really stand out. 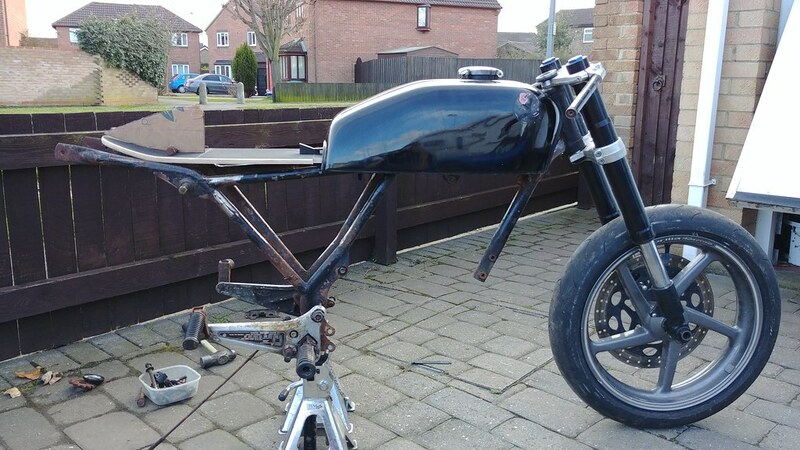 This won't be a brat, but it will have a couple of small cues from brat bikes (like the seat base), but it will definitely still have a small rear hump and a more café style colour scheme, probably with quite a lot of polished/brushed parts too. I'm kinda seeing it as a combination of styles. Hopefully it'll work out nice in the end. I'm focussing a lot on aesthetics so I'll be making sure it doesn't just end up looking a dogs dinner of parts. It may sound that way at the moment but I've got a clear image in my head of how it will all flow together - it's just difficult to visualise and show when there's only half of it there! As for the frame, what you've described is exactly what I'm planning on having done. The new top bar will join at the top of the shock mount such that it's perfectly level. I'm lucky in the fact I've got two good friends who are both very good welders. I've said I don't mind how they do it as long as the end result is the same, but I envisage they'll cut the top bar out completely and weld a new one in, which will taper at the rear end to merge with the top of the shock mount. Not sure how that input is helpful in any way, shape or form. Ok im gonna be helpful - skateboard seats are a joke, and a very good one! Have your welder friends help you with a sheet metal seat pan instead. Its not like anyone is gonna see that piece of wood under all the padding and leather anyway. See that's kinda where you're wrong. 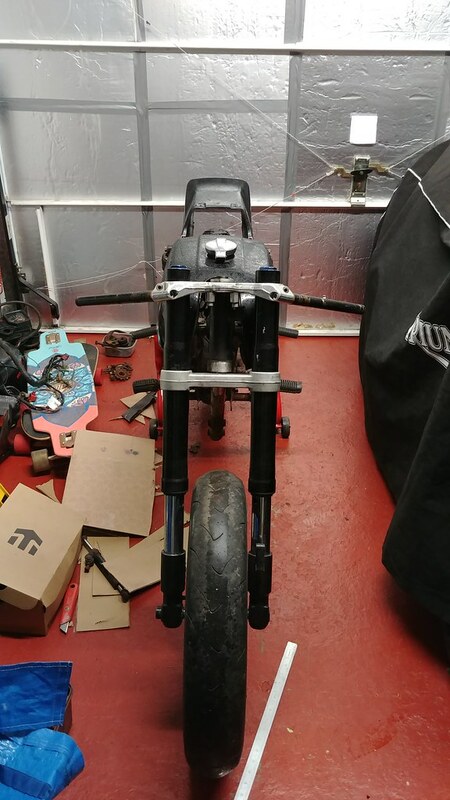 Since the deck is going to form the top of the bike, it will also be where the hump mounts to, where the seat attaches to, license plate and tail light. 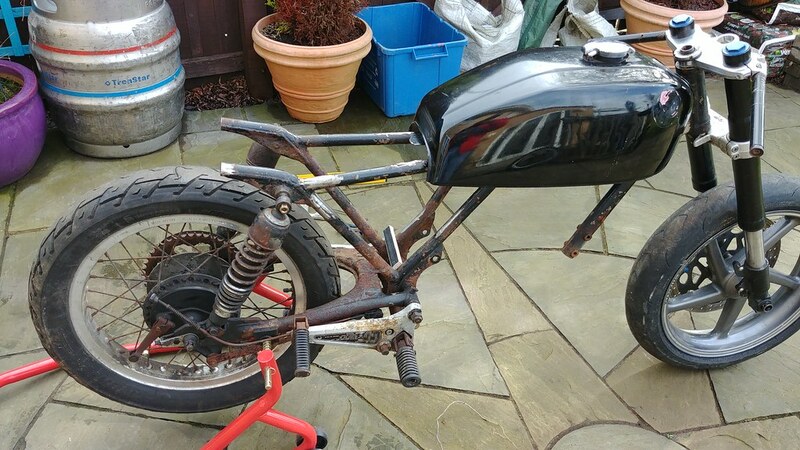 Looking from the back of the bike the underside will be clearly visible, hence it'll be varnished and polished. It will be visible to those who pay enough attention to look at details and notice that it runs all the way up the bike to the tank. I'm not using a skateboard deck as a seat base through inability to make a sheet metal one - so there's no need to try and be patronising about it. I'm doing it through choice - I'm a skater & a snowboarder who happens to be a bike enthusiast too - so if I can combine those hobbies and still build a bike that looks how I want it to then that's what I'm gonna do. I'm still failing to see where you've been helpful. So some progress the past couple of days. 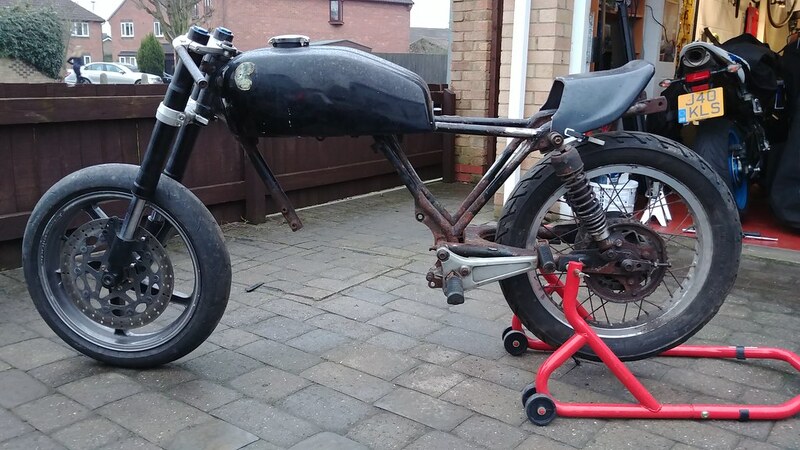 I started mocking up the seat base by trimming the deck so it would fit under my tank, so I could get a reference for my fabricator of where I wanted the bike to stop etc. I chopped one end off the deck and made it slightly narrower to clear the tank. Eventually it would be tapered in to match the inwards taper of the frame. Once done, I clamped the deck in place and had a sit to make sure it felt somewhere near. It did. Happy with the result, I began to mock up some hump profiles out of cardboard. The plan was I could start developing the hump whilst the frame was with the fabricator. I was quite happy with this one. Very simple and quick, I know, but primarily it gave me an idea of a rough size and profile that would look good on the bike. It was only just after this, that I began chatting with my dad and was explaining to him that I'd like to add a slight "ducktail" to the back of the bike, to give a nod to the original CB250RS tail unit. He couldn't remember what the stock one looked like so I dug it out to show him. Not sure why I'd never thought of it before, but why not simply re-use and modify the stock tail unit. After all, it's already quite square sided so would go quite nicely with the tank. 5 minutes later and some rough cuts made, I had a tail unit I could play about with and enhance, rather than starting afresh. Today I dropped the back end back onto the bike so that I had a bit more reference to the proportions etc with the back wheel in place. This is what I've ended up with so far. Initial impressions are that it looks good. With a bit of work, it could be bang on the money. It's currently sitting a little bit high and a bit too upwards inclined for my liking, so tomorrow I'm gonna smooth off some stuff so that it fits a bit better (at this part of the frame, it's slightly too wide for the cowl to sit comfortably). I'm going to trim the lips of the inside of the cowl and also chop some of the frame. It's gonna be needing cut whichever route I go, so no harm in chopping some bits off now as long as I leave enough on for my fabricator to work with. So that's that. At the moment it's a complete about-turn and the deck idea may be scrapped (as I'm sure Mr Datadavid will be thrilled by ). I'm gonna keep it to one side for now in case I come back to it but I'm loving the lines with that cowl. Very retro-racey. Let me know what you think! 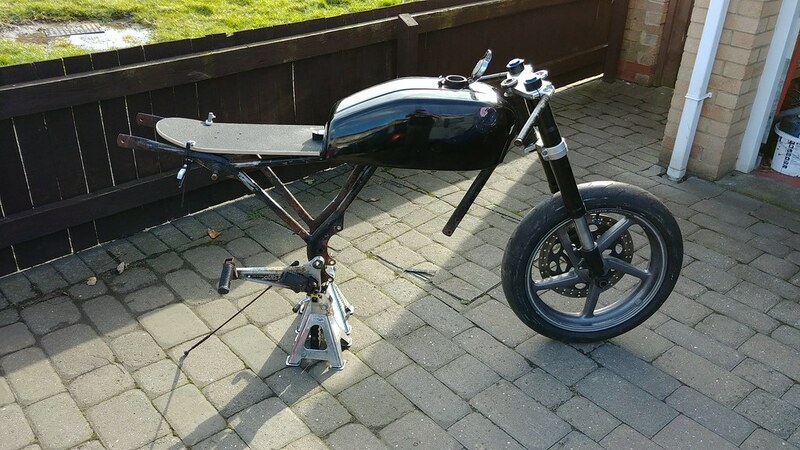 This is going to sound off the wall, but have you looked at it with stock seat and rear cowl and seen how that might be reshaped? It might look more balanced. Just a thought. Stock is probably too long, but there may be a compromise in there somewhere that would work. Unfortunately I no longer have the stock seat, I scrapped it as it was ruined but kept the cowl. Annoyingly, the stock cowl, moved right up forward to where the original side trims would meet the tank, was just to say too long, else it wouldn't have needed much modification at all. I'll report back later today on where I get to! You see! I helped you in the right direction! wood IS cool on bikes, maybe you could take the skateboard and steam bend it into a rear fender? It just isnt very useful mounting stuff on in the long run. So a bit more done. Not sure if the cowl will work as it's still rather tight. Lopped off the back end to start with and gently persuaded the back of the outer tube inwards a bit. Taking care to not bend the frame itself. I then played about with the cowl lopped the deck down to make a makeshift seat base. Don't worry Datadavid, it won't stay like that. I dropped the front wheel of the 250 in to see how it looked. Happy with the look of it at the moment. Would be nice if I could get the cowl a little lower mind and it needs some shaping work to blend it into the frame. Still think I need the top bar of the triangle raising up to come in above the shock mount. That's a very valid point, not looked at it without it being on the stand yet. Shocks may be an option though as I need to buy new shocks anyway. Still not sure if the cowl will actually work as it's a bit of a stretch to get it to fit at the moment. May have to go for a similar styled, "universal" seat cowl. That tail does appear to match tank shapes rather well. The overall look is not bad. Slightly longer shocks would help - agreed. Will an XR500 slip in there to replace the 250 motor? That would make for a fun bike. 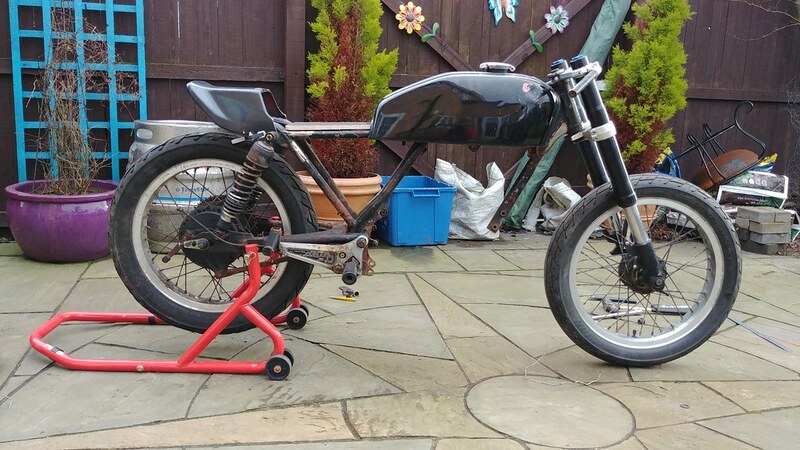 Slim, light, ton of torque and styled like a seventies single racer.